Chinese manufacturer Oppo, which falls under the umbrella of BBK Electronics alongside OnePlus, has just announced its latest flagship device, the Oppo R15, and a more premium "Dream Mirror" edition of the same. While the chances of you seeing one of those in the US, the Oppo R15 is largely expected to donate its general design to a phone that you will actually be able to buy - the OnePlus 6. This collaboration has happened multiple times before and we expect that we're in for another wild ride courtesy of Oppo and OnePlus. Have one in mind, but for all intents and purposes, the images below could very well depict the upcoming OnePlus 6 trooper. So, what does the Oppo R15 and R15 Dream Mirror have in store? Featuring a glass back and a metal frame and rear-positioned fingerprint scanners, Oppo's new phones both have notched 6.28-inch OLED displays with a 1:2.1 screen ratio and a resolution of 1,080 x 2,280 pixels. With a screen-to-body ratio of nearly 90%, the front of the Oppo R15 is mostly screen. With dimensions of 155.1 x 75.2 x 7.4mm, the Oppo R15 is quite comparable to the Samsung Galaxy S9+ which has a similar footprint (158.1 x 73.8 x 8.5 mm). The Dream Mirror edition is ever-so-slightly different at 155.3 x 75.0 x 7.5mm. Powering the regular Oppo R15 is a Helio P60 chipset, whereas a Snapdragon 660 is ticking inside the Dream Mirror edition of the device. Both phones have 6GB of RAM and up to 128GB of storage. A 3,450mAh battery is powering the regular R15, while a slightly smaller 3,400mAh one is making the Dream Mirror edition click and tick. Fast VOOC charging is available on both. The two differ in camera setups, too: the R15 has a 16MP f/1.7 IMX519 snapper + a secondary 5MP f/2.2 camera that is capable of intelligently recognizing scenes and aiding the main shooter in shooting cool portraits. Up front, there's a 20MP f/2.0 selfie snapper. 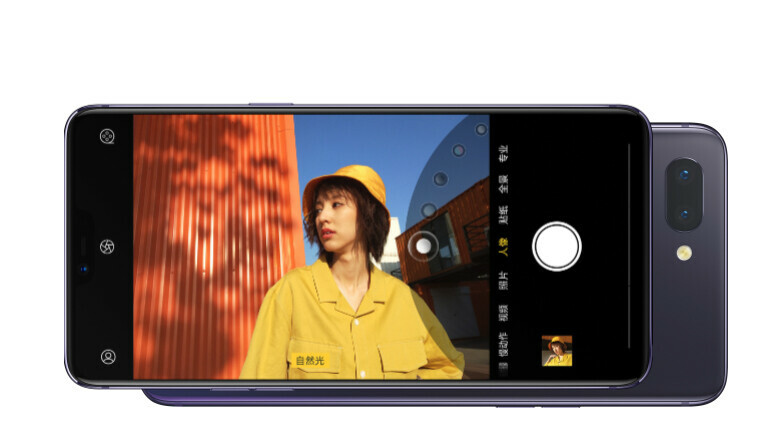 The Dream Mirror edition has the same main 16MP f/1.7 IMX519 unit, which is now aided by a more lavish 20MP f/1.7 camera that most likely fires up in ultra low-light scenes (similar to the one on the OnePlus 5T). Pricing for the R15 is pinpointed at CNY 2,999 ($474), whereas the Dream Mirror edition will be available for CNY 3,299 ($521). This gives us a starting point for the probable price tag of the OnePlus 6 - we expect it to be somewhere in the sub-$500 to ~$580 window depending on the variation. Of course, there's no saying if the final design of the OnePlus 6 will resemble the Oppo R15 that much, though we are willing to put our money on that. Specs-wise, the OnePlus 6 will certainly opt for the Snapdragon 845 chipset over the mid-range offerings. As we've explained in our lengthy OnePlus 6 rumor round-up, other expected specs include 6/8GB of RAM, 64 and 128 or 256GB of native storage, as well as improved cameras. OnePlus 6 without SD 845. Why the bottom bezel? The notch looks so ugly with the bottom bezel. The bottom bezel needs to get removed in order for the notch to look cool. China= the land of copycats!!! I though Asians were supposed to be smart? They are, as they copy but use Android! What about Asus, LG ? Better than Koreans who invented the Galaxy Note 7 and this year the lousy S9... OP6 will not lag like S9+ after 3 months of usage. S9+ is absolutely the BEST android phone at the moment. LAG ? Thats a feature of your brain. 1080 x 2280 on 6.28" display is trash resolution. Put in a 1440p display and i'm getting OnePlus 6. I can't believe they are still using 1080p on a so called "flagship killer". Everyone expected they will include 1440p on OP2 and that didn't happened. And generations later they are still on 1080p. I haven't had OP device since OPO, put in a better display and i'm getting 6. I do like how the side bezels are not as big as the iPhone x. Where's Apple's "suing machine" at... I am so glad that Samsung create its own path rather than follow.